This is a really nice tool that allows you to see what they see in terms of a view of IPv6 deployment by country and by network. Whereas the World IPv6 Launch measurements are an opt-in measurement for networks, Akamai publishes data from every network where they see IPv6 traffic, so they report some large deployments that we don’t have in our data. Kabel Deutschland is an example of a network with a large IPv6 deployment (35% of the traffic coming from their network to Akamai’s servers uses IPv6) that isn’t in our database. Note that the Networks ranking is determined by the volume of IPv6 requests to Akamai. This explains why Comcast Cable is listed first even though Verizon Wireless has a higher percentage of IPv6 requests. Comcast’s networks have simply sent more requests in total to Akamai’s network than Verizon Wireless’ network has. Akamai’s Network trend charts also line up nicely with the World IPv6 Launch measurements as Akamai has been one of the long-standing providers of data into that project (although, as Phil noted, only for networks that opted in to participating in the WIPv6L measurements). 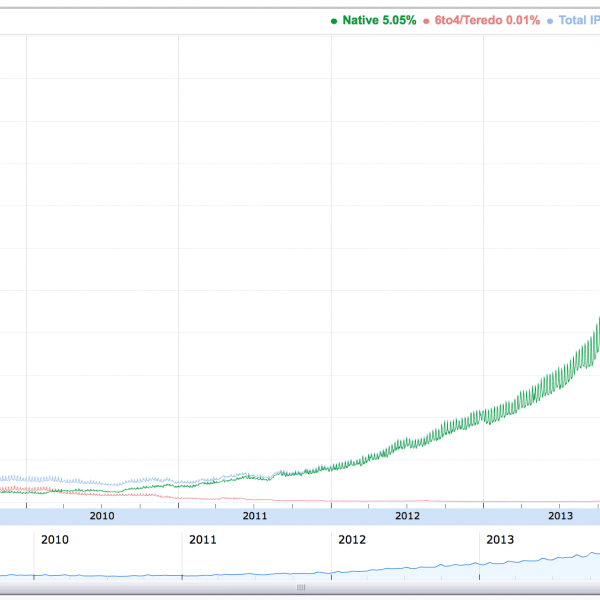 We’re very pleased to have these new charts out there from Akamai – and look forward to continuing to watch them grow as IPv6 continues its global march toward full deployment! P.S. If you haven’t yet started with your own IPv6 deployment, please visit our Start Here page to find resources to help you get started!